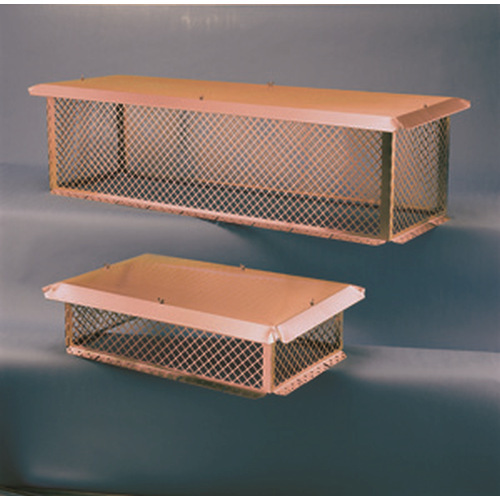 To Meet The Increasing Demand For Further Protection Of Not Only Flues But Also Crowns, The Sweeps Perfection Solid Copper Rain Cap (Multi-Flue) Were Developed . As with the single flue models, these multi-flue caps were developed with the assistance of Chimney Service Professionals–designed rugged with the added features pros are looking for. All of the Sweeps Perfection Solid Copper Rain Cap (Multi-Flue) are knockdowns, easily assembled from only four parts to create a solid, high quality copper rain cap that will give your customers years of service. The Multi-Flue Caps come with a unique mounting flange which is notched every 6" to allow the installer to easily use a hand-seamer to form the flange to varying pitch crowns. Included with each cap are the appropriate number of tapcon masonry fasteners. The removable lid allows easy installation and yearly evaluations and/or cleanings by a chimney service professional. NOTE: Rain caps require a minimum 3” clearance from the top of flue tiles to the cap\'s lid. The copper caps have been discontinued, and stock is limited.